anniesthreads Such an easy transaction! Was 10/10! cj81914 Great seller - very friendly and easy to organise a deal with :) would definitely recommend! 💋 Downsizing my wardrobe! 💋 $8.50 standard post on everything under 500g. 💋 Happy to negotiate on everything, especially bulk orders. 💋 No returns! 💋 Will send more photos if requested. 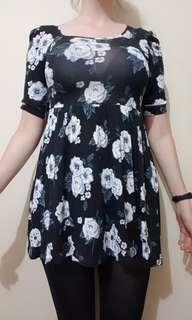 Bought second hand but never worn; fits like a size 8. Invisible zip under one arm to get on and off. Bought second hand almost 10 years ago but only worn once. Stretchy fabric, but fits more like a 10. Is very short in the skirt and only just covers my bum. Red pants with eyelets and lacing on outside of legs. I underestimated online sizing so they've sadly never fit me (hence why I'm covering the open zip in pic 2) but still have tags on. Bought during a 50% sale on Boohoon originally priced at $44. Bought second hand and never worn; still has its $10 price tag. Unsure if real leather but definitely feels like it- material is thick and heavy like real leather. Kmart black skirt made from stretchy material with elastic waistband. Bought brand new and worn only a handful of times. Would be perfect as a slip skirt under something see through. Layered black skirt bought second hand but never worn. Tag has been cut off but fits like a 10/12. Black and red tartan skirt with navy blue elastic waistband. Bought second hand but never worn. Valleygirl tartan skirt made from a stretchy knitted weave. Bought second hand but never worn. Red and black tartan skirt from Retro Girl. No size on tag but fits an 8/10. Purchased second hand 2 years ago and sadly never worn. 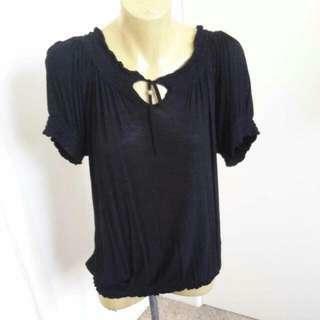 Bought at a garage sale 2/3 years ago and was told it was a Zara sample that wasn't in stores. Bottom half is a leather look material with lining underneath. I've never worn it but unsure of wear before I owned it. Bought second hand but never worn. Xcepsion brand top with white front panel and sleeves to look like a shirt, and black back panel and loose front panels to look like an open vest. All one garment. Size M.
Bought second hand and never worn. 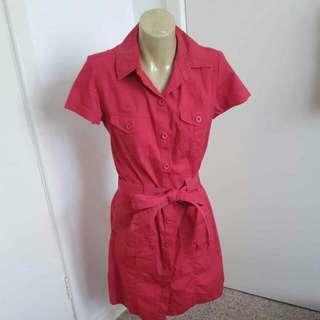 Metro Now brand red short sleeve button up dress with removable belt. Made from fabric that feels like cargo pants or a light jacket. Size 10. Bought second hand but never worn. 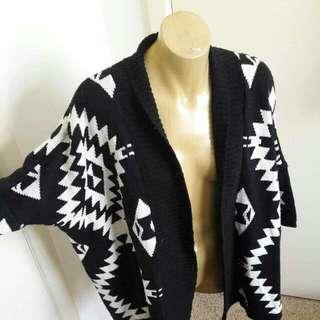 Black and white geometric art deco aztec design with cropped sleeves and no buttons. No tags but would fit comfortably anywhere from a size XS to a L.
Brand new and only worn a handful of times, washed since. 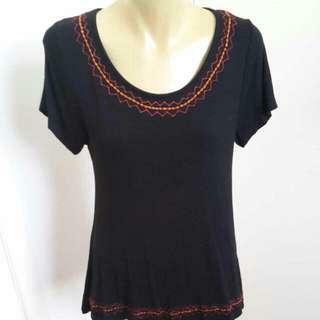 Ishka top made from soft floaty black material with red and orange stitching around the neck and at the bottom, both only on the front of the shirt. Size M.
Bought second hand but never worn. Prestige Collection brand straight neck cardigan with intricate crochet pattern ans one button at the bottom. No tags but would fit Size 8-12. Bought second hand but never worn. Valleygirl cropped cardigan with straight neck and three buttons. Size S.
Bought second hand but never worn. 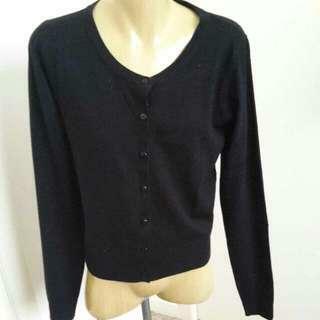 Black button up cardigan with straight neck. No tags but would fit Size 8. Bought second hand but never worn. Gordon Smith brand straight neck button up cardigan with floral design on buttons. Size M.
Brand new but never worn. 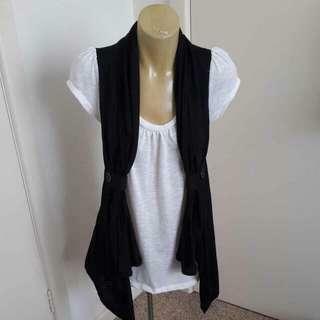 Now brand (either from Big W or Kmart) black button up cardigan with a scoop neck. Size M.